than one day (24 hours). date of the accident which results in bodily injury. during the first year of coverage under the plan. Accidental injury can bring about financially devastating consequences. ACE has put together some plans to give you and your family sufficient protection. Coverage Plan 1 Plan 2 **Additional Benefits per Unit * Each dependent child will be entitled to 25% of the above coverage except Child's Education Benefit. 'Child' means any legally dependent, unmarried children (including stepchildren and legally adopted children) over 30 days but under 21 years old. * Each dependent child will be entitled to 25% of the above coverage except Child's Education Benefit. 'Child' means any legally dependent, unmarried children (including stepchildren and legally adopted children) over 30 days but under 21 years old. In the event of an accident which results in Death or Permanent Disablement benefit of up to RM100,000. 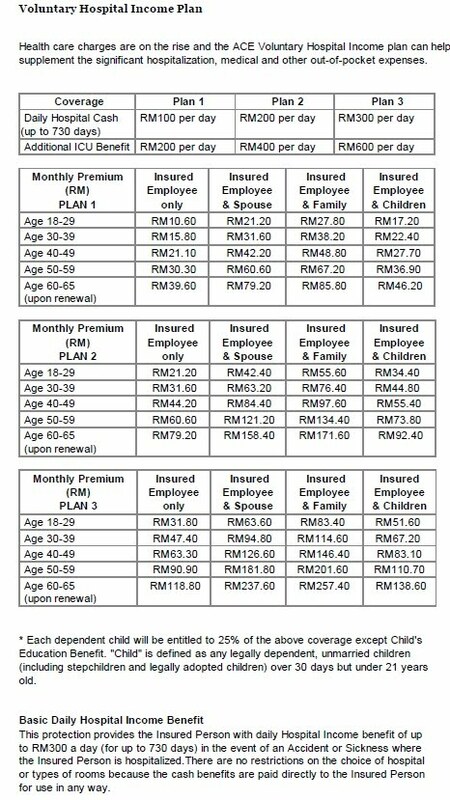 This protection provides the Insured Person with an additional hospital income of up to RM200 a day (up to 730 days) in the event of an accident, where the Insured Person is hospitalized. Cash benefits are paid directly to the Insured Person and can be used to cover stays in any hospital or room type. The Daily Hospitalization benefit payable is calculated from the first day of hospitalization. However, no benefits shall be payable for a hospital stay that is less than one day (24 hours). Hospital Confinement must occur within 20 days from the date of the accident which results in Bodily Injury. In the event the Insured Person sustains Bodily Injury which results in death within 365 days from the date of the accident, he or she will receive a Funeral Expenses benefit of up to RM2,000. If the insured employee or the Insured Spouse sustains bodily injury which results in Death within 365 days from the date of the accident, he or she will receive the lump sum amount of the Child's Education benefit of up to RM10,000. Monthly Premium (RM) Plan 1 Plan 2 ** Additional Premium per Unit "Permanent Total Disablement" shall mean disablement suffered for at least 12 months and will in all probability entirely prevent the insured person from engaging in any occupation for which he or she is capable by reason of education ,training or experience for the remainder of his or her life and which is beyond reasonable hope of improvement. Individual Only RM7.40 RM12.80 RM4.00 "Bodily Injury" shall mean Accidental Bodily Injury which, within 12 months from the date of accident, results in the Insured Person's death, dismemberment or permanent and irrevocable disablement solely and independent of any other cause. Individual & Family RM16.90 RM30.80 RM10.00 Please click here for the percentage of the Sum Insured payable in respect of specific disabilities. What Is 36 Critical Illness?